Memphis International Airport (MEM) serves over eleven million passengers each year, connecting southwestern Tennessee with numerous international destinations. Located near to the Mississippi river, Memphis Airport provides easy connections to air, road, river and rail networks. MEM Airport underwent a major upgrade during 2005, including renovations to the B Concourse, tenant sponsored jet bridge improvements, and major upgrades to each of our concessionaire partner spaces. Memphis International Airport also handles more cargo traffic than any other airport in the world, with Federal Express and other freight carriers operating key bases at MEM. 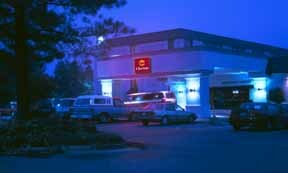 Memphis World Airport Guide provides you with access to a complete selection of Memphis airport hotels. Utilize the discounts offered directly from the hotel, with the assurance of secure booking. Extra services include airport car rental, airport car parking, and flights to and from Memphis International Airport. Please note: The term Memphis International Airport MEM as well as all associated graphics, logos, and/or other trademarks, tradenames or copyrights are the property of the Memphis Airport authority and are used herein for factual descriptive purposes only. We are in no way associated with or authorized by the Memphis Airport authority and neither that entity nor any of its affiliates have licensed or endorsed us.